We have a paralyzing number of choices in our culture today. Just picking a loaf of bread to buy at the grocery store can be a five-minute process that leaves you feeling mentally drained and annoyed by all the different factors you have to weigh for something that seems like it would be so simple. What planner or gradebook should I buy? Should I use interactive notebooks with my class? Would I be better off with this particular whole class quiz app, or should I find another one? Which desk arrangement would be best for the types of activities I’m doing with kids this week? Here’s how to make better decisions, make them more quickly, and feel comfortable sticking with them after they’ve been made (instead of second-guessing yourself). 1) Set limits on how much time you will spend exploring your options. I’ll give you an example that happened to me recently. My team and I have been swamped with emails from 40 Hour Teacher Workweek Club members and really needed some sort of program that would allow us to have a proper help desk where members can get their questions answered and submit a help ticket if they need assistance. Choosing a platform is a decision that I could have spent days or even weeks agonizing over. But I have a lot of other decisions to make and a lot of work to do, and not a lot of time. So I gave myself one hour to make a decision. I Googled it first, “best helpdesk email,” and scanned a few articles. It became apparent that there were at least a dozen options, but only two major players in the industry, so I immediately ruled out all the others. I didn’t want to explore every option available, just the best ones, and if most people were choosing one of these two platforms, that was social proof enough for me to feel okay about not looking into the others. I then asked a web developer friend for his opinion (rather than crowdsourcing in a group or asking Facebook friends, and waiting days to see all the different opinions and conflicting advice). My friend echoed what I had discovered on my own: There were two good choices and either would probably work just fine for me. So, I spent the last thirty minutes of the hour I had allotted to this task to exploring the two options, comparing features and pricing, and reading reviews online. This was the point where most people would have felt like they’d gotten close to making a decision and decide to stop there for the day. However, I knew my decision hadn’t truly been made until I took action on it and I didn’t want to have to block out time on the following day to processing the information all over again. There will always be something new and probably even better out there, and if you get “shiny object syndrome,” you will waste a ton of time. Make the decision as soon as possible and don’t overthink it. I’d spent about an hour on the decision-making process at this point, so I bought the tool I thought was best and immediately moved into the phase of learning how to use it. If I’d found it too difficult or encountered a major problem with it, I would have reached out for support and either pushed through or switched to the other tool at that point. But I simply have too many other decisions to spend days or weeks weighing all the options and going back and forth. Maybe I should have picked the other tool. Maybe I would have liked it better. But the choice I made is just fine and works great for my needs. I encourage you to follow a similar process as you make your decisions, particularly around tech tools or which teacher planner you should buy or any sort of decision where there are tons of options out there. Set a time limit for how long you will spend researching the choices, and when time is up, go with your gut and make a decision. 2) Never procrastinate in a way that causes you to make the same decision twice. Some people have a tendency to procrastinate because they’re afraid they’ll make the wrong choice. So they weigh their options, come to a likely conclusion, but don’t ever make that final decision and pull the trigger. They say they’ve decided, or they’ll “probably” do XYZ, but they don’t take action on that decision because they haven’t really made up their minds. Unfortunately, I’m not always as decisive as I was in the example I gave you about choosing the email platform. Here’s sort of a non-example of what happens when you aren’t decisive. I use a service called eMeals for my meal planning. I really love eMeals (and am an affiliate for it) because it’s $59 for the whole year and they send me seven new recipe ideas every week. All I have to do is pick a few I want to make (either from the new recipes or my recipe library saved in the app), and eMeals creates the shopping list for me. The whole point is to keep me from wasting time meal planning, or worse, NOT meal planning and standing in the kitchen for 20 minutes trying to figure out what I’m going to make while hoping I’m not missing a key ingredient. The other purpose is to make grocery shopping quicker and easier: Before eMeals, I would create my own shopping lists, which I hated doing, and I always forgot an ingredient. Now I can plan my meals for the week and have a shopping list ready in less than five minutes. So, in general, it’s a good system, but on this particular week, I had favorited a bunch of different meals and never made the decision about which meals I was going to make. I’d weighed my options, but I didn’t take action. I figured it didn’t really matter and I’d narrow things down when I got to the store. When I got to the store, my phone rang and I was completely distracted by the conversation. By the time I got off the phone, I was in the middle of the store and still didn’t know what I was there to shop for. I figured something out midway through the aisles and had to backtrack across the store to get an ingredient I was going to need after all, and ended up getting home and realizing I’d still forgotten something. If you live your entire life this way — never really making a decision or acting on it until you’re completely out of time — it will wear you out and impair your ability to create the life you want to live. So what went wrong here? I had convinced myself that I’d made a decision — I knew basically what I was going to buy, right? All I had to do was make those last few selections between meals when I went to the store. But that means the decision wasn’t really made. I was procrastinating instead of being decisive and I ended up having to spend my evening making the decision and then my afternoon the next day thinking through all the same questions, all over again, at the store. While this may sound like a minor thing, it created double work and double hassle for me and got me less than optimal results. The finite amount of brain power you have is constantly being expended on finishing the decision-making process, and you never get to fully take that task off your mental to-do list and have closure. So, when you sit down to make a decision, make it right then and there. Don’t procrastinate in making the final decision so that you end up doing the same work twice. Just had time to skim this post? Download the audio and listen on the go! Much of our decision paralysis comes from trying to find the PERFECT thing: The perfect chair for the desk, the perfect lesson to implement during an evaluation, the perfect outfit for presenting at a faculty meeting. This desire to find the perfect thing subconsciously puts more emphasis on the decision that it warrants — you’re pressuring yourself to find perfection for something that is relatively minor in the grand scheme of things. And that creates decision paralysis — there are hundreds of thousands of options out there. How will you ever find the one that’s just right? Even when you think you’ve found it, there will still be that little nagging thought in the back of your brain that wonders if there was something even better. In most cases, the best choice is not the one you’d need to spend more hours hunting down, it’s the one that you have right in front of you, ready to use now. If you’re in the store and the chair in front of you is comfortable and affordable, why leave empty-handed and spend the whole day trekking around to other stores and comparison shopping online? Get the chair that’s just fine, and move on to the next task and decision. If you found a lesson that would be “just fine” for your evaluation, don’t spend hours looking for something better — take some time to adapt what you have already and make it the best possible lesson and then move on. 4) Think of “70% sure” as an actual decision. Here’s the good news: You don’t need to wait until you’re 100% positive on most things in order to move forward with the decision. The majority of decisions aren’t important enough to keep mulling over and over until you reach 100% certainty. (And if we’re really honest? The big decisions in life are so big you’ll never feel 100% sure you’re doing the right thing, anyway.) For most classroom decisions, 70% sure is going to be just fine. For example, if you’re not sure whether you should use Bloomz or Remind as your parent communication app, don’t wait until someone has 100% convinced you that Bloomz is superior and you’re sure it’s going to be the absolute perfect tool for your particular needs. You’ll spend weeks trying to weigh the options and end up with sticking to your current method of “crumpled papers in the bottom of student backpacks” by default. Instead, go online and find a comparison of the two tools, ask the opinions of teachers you trust, and then pick one. Get in there and use it. Try it out. Experiment. If you hate it (which you almost certainly won’t once you get past the learning curve), you can switch to something else the following year. Don’t allow yourself to stay in decision paralysis until you reach 100% certainty. When you’re mostly sure, trust your gut instinct, and keep moving forward. 5) Avoid second guessing yourself after the decision is made unless you’ve received new information that warrants reconsideration, AND you can actually do something about it. If you learn something new that would have affected your decision, you still don’t want to revisit or question the decision-making process if you don’t have the ability to change anything. If you were debating between two purchases, made a decision and started using the purchase, and then discover the following week that the other one is on sale now, do not criticize yourself or allow yourself to second guess. Most of life is not nearly as black-and-white as it seems when we’re paralyzed by decisions. There are rarely decisions that are all good or all bad. Everyone is entitled to making a choice and realizing later it wasn’t the best option after all. Don’t allow that to cause you to stay in decision paralysis on the next decision by replaying it in your head: But last time, I messed up and picked the wrong thing! This is not a game of The Price Is Right where you’ve got a yacht behind door number one and a donkey behind door number two. What’s far more important than the actual decision is protecting your time and managing your energy. Keep moving forward and focus on the decision that you need to make next. There will never be any shortage of decisions to make, so you will get plenty of practice in fine-tuning your instincts and decision-making skills! Want more help with setting priorities & figuring out what to eliminate? Get the free challenge sent to your inbox now. Hi, I found this article particularly helpful to me at this time of year. 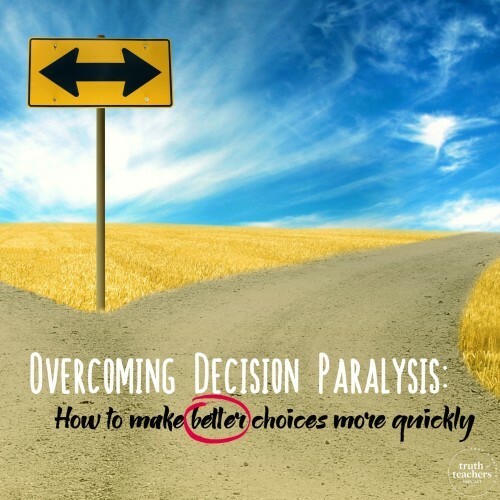 Decision paralysis is so draining and yet such an easy trap to fall into with so many decisions not only at work, but also at home and with my own children. The desire to find the perfect solution is such an easy trap to fall into. What parent or educator doesn’t feel the weight to make the best decisions for our children? The second guessing regret piece is probably the most difficult part for me. I would love a follow up article on this topic. Thanks for your help and for sharing. I laughed out loud reading this. I was thinking about how I had been trying to decide between Bloomz and Remind. I finally made a decision and was wondering if it was right. Then you mentioned just that decision in the article!!! If it matters, I picked Bloomz. Hope that it works out for me!